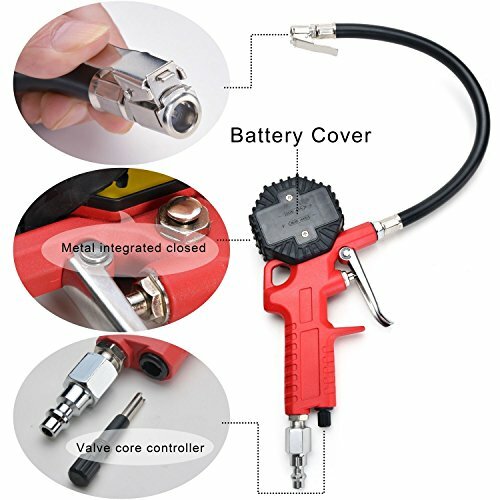 All in one design, combined inflation gun, flexible hose, straight lock-on air chuck, and digital gauge. This adequate closure will avoid any leaking. And the pressure measuring can last longer and be more accurate. 1. When measuring tire pressure, tire should keep cool. 2. For standard tire pressure, requirements of automobile factories or tire manufacturers shall prevail. 3. Straight lock-on air chuck (Socket-style gas interface) well connects with most of stem clamps of car tires; while for some special stem clamps, just connect the included 90 Degree Valve Extender onto air chunk and it will help. EASY USE: The air inflator can effectively fill in your car tires in minutes. It won't easily leak air as it has Valve core controller and air inlet to prevent air leaking. The included digital tire pressure gauge makes it even more professional. The gauge of high precision can accurately measure pressure up to 150 SPI. PERFORMANCE TESTED & calibrated highly accurate to ±1% features bright 0-150 PSI LCD display. VALVE EXTENDER + LOCK-ON AIR CHUNK: The air inflator comes with 90 degree Valve extender, flexible rubber hose and straight lock-on air chunk, which makes it much easier to reach all tires of various cars. You can press the trigger of inflation gun for times to fill air in tires. You can also press the pressure relief button or loose the Valve core controller to relief air.